Breakfast Benedict - Vegans Eat What? Vegans Eat What? Think you have to stop eating old favorites when you change to a vegan diet? Absolutely not! This Breakfast Benedict is a great example. 2 or 3 large ripe tomatoes, cut into 14 slices. The night before, drain the excess water from the tofu and slice it across the width into 14 pieces. Pat each piece dry and place in a single layer in a shallow glass pan. Pour the Bragg’s or soy sauce over the tofu. Cover the tofu, put it in the refrigerator and allow it to marinate overnight. The next morning, brown the prepared tofu in a non stick skillet (you can use a small amount of oil if desired). Set the tofu aside and keep warm. Meanwhile, make the sauce or heat it if you made it the night before. Sauté the onion in the margarine until it is translucent. Transfer the onion to a blender and add all the remaining sauce ingredients. Blend until smooth, then heat in a pan until warm. Top each toasted muffin half with some spinach, a tomato slice and a piece of tofu. Cover with about 3 tablespoons of sauce. If desired, finish with freshly grated pepper and thin slices of avocado. Now sit back and enjoy! Use your favorite toasted bread or waffle in place of the muffin. If you have less time in the morning, make the sauce the night before and simply heat it in the morning. The recipe makes extra sauce so you can make more later in the week, or use the sauce on cooked vegetables, as a condiment on sandwiches, or over just about anything! 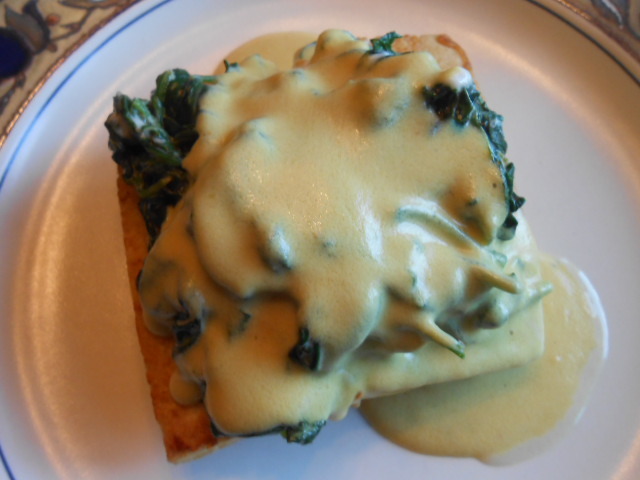 Try replacing the Hollandaise with avocado sauce. Simply make our Guacamole and thin it with a little water.